Hi I'm Chris Sizemore executive editor for the BBC's Knowledge & Learning product. Today marks the beginning of a journey to unlock the learning potential of BBC content. As a first step we are releasing a new website which we’re currently calling Knowledge & Learning Beta. When complete the Knowledge & Learning product will bring together factual and learning content from over 100 existing BBC websites, from Bitesize to Food to Science to History and will forge them into a single consistent user experience designed to make learning feel effortless and delightful. The product will play a 'glue' role too, helping bind the different parts of BBC Online together for audiences. 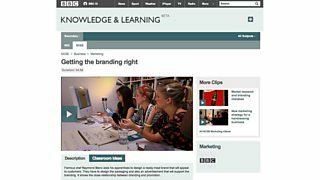 The content produced by the Knowledge & Learning (K&L) team ranges from the recent Great British class calculator, revision guides for students, BBC programme clips to be used by teachers in classrooms to topical features around the arts, history, food, science, natural history and more. We hope to redefine how our audiences consume this educational and factual content by effectively combining technology with storytelling. We have already transformed the way in which we produce content within our topical genre sites such as Nature, History and Science. What we are announcing here is another major step towards realising our ambition. For the all-new Knowledge & Learning Beta website our initial focus has been twofold: First, we’re rolling our topical genre content into this new site. We aren't changing the URLs but we are changing the visual banner on, for instance, the History index and pages. Second, we’re adding to the new site our Class Clips audio/visual resources that help teachers create engaging classroom discussions for students. Over the coming months we’ll be migrating all the content we create for teachers, students and lifelong learners into the new site. The existing Class Clips website is well loved and used by many thousands of teachers and students each week. However, the current experience isn’t optimised for mobile or tablet which is increasingly important in the classroom. Our new website has been built from the ground up using responsive web design, meaning that the content can be viewed just as easily on any web browser, on any screen size, and on any platform. Our team have used a sophisticated system that detects the capabilities of each browser and device and serves just the content that’s appropriate in order to minimise download times. We will build from this solid base as we add new areas to the Knowledge & Learning Beta website. One of the biggest challenges of the project so far has been re-processing all of the content that resided in Class Clips. Over the past five months we’ve transcoded everything again, ensuring that there are high-quality versions of each clip that will play out on any device. In parallel the team has also been reviewing all that content, assigning it a place in the new information architecture and, in some cases, rewriting the notes for the classroom. This content is organised around the UK’s national curricula. To start with we’ve included around 2000 of the 10,000 programme clips that currently reside in Class Clips and we’ll be adding the rest over the coming weeks. We’ll continue to publish thought-provoking topical features such as How anarchists exposed secret nuclear bunkers in genres like history, science, natural history and the arts. Meanwhile the team is also busy building a new clip search tool that will be added to the website shortly along with support for native UK languages such as Welsh - so keep coming back to check on our progress. We would very much welcome your feedback on the new site. You can either add comments to this post, or email us at knowledgeandlearningfeedback@bbc.co.uk. Chris Sizemore is executive editor for the BBC Knowledge & Learning product.